Here are some photographs of schools in semi-rural areas of Maharashtra, India. The first image is of St. Thomas School at Wai village, near Panchgani. The second image is of a small rural school near Vikramgadh in Maharashtra. 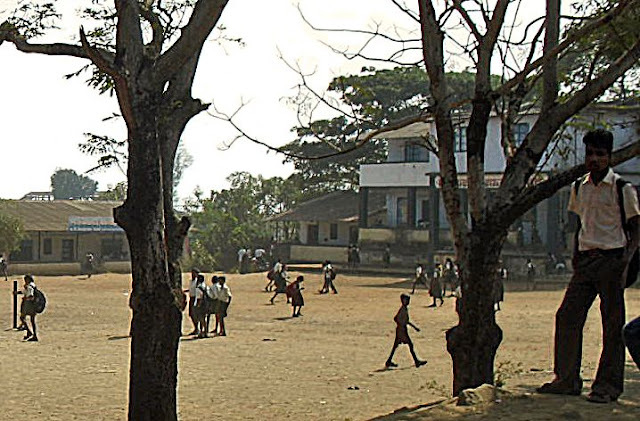 The girl students can be seen walking on the small playground. 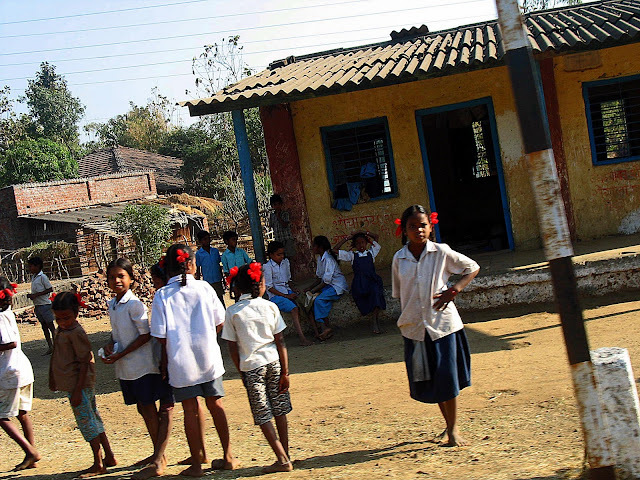 In the picture above and below it is curious to note that all the children are not wearing an uniform. The uniform seems to be a blue skirt and white blouse with red ribbons for the hair. 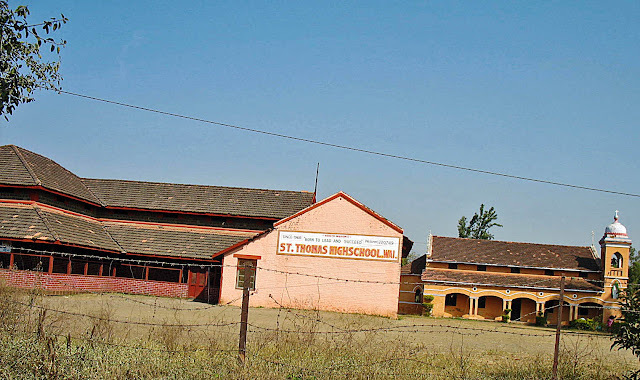 The picture below is of another school building. In the verandah there are photographs of national heroes like Subhash Chandra Bose as well as some gurus like Swami Vivekananda. There wasn't a proper playground for the school and it was surrounded by houses and huts. 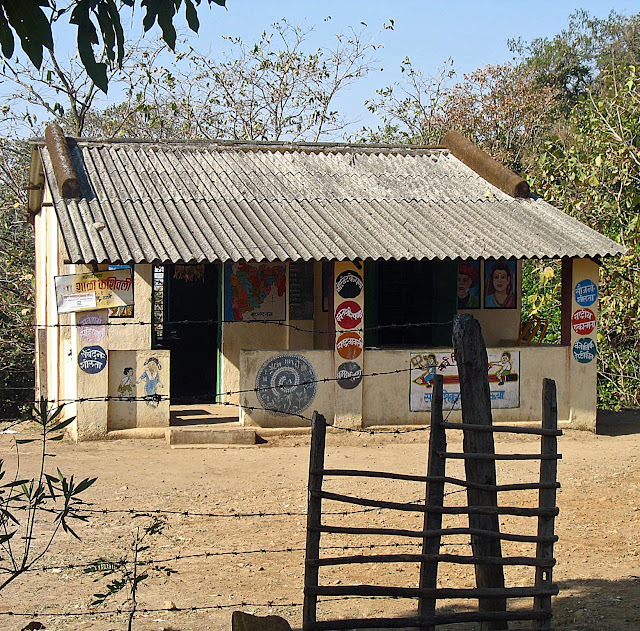 The image below is that of a school room for primary students. A closer look at the writing on the pillars reveals some interesting adages, lessons for students, written in Marathi. The first pillar has in its first circle, written in white on a black background, the words "Neetnitkepana" which in Ënglish means "Tidiness". The second circle in red says "Vaktshirpana" which means "Punctuality" in English. The third, written in white on a ochre circle says "Rashtrabhakti" which means "Patriotism" in English. I was unable to read the last one. The pillar at the far end also has some lessons for the students. The first says in the blue circle "Soujanyasheelta" which means "Decency" in English. The second circle in red reads "Rashtriyaekta" which means "National Unity" in English. The last one in green says "Vaygyanik Drishtikone" which means "Scientific outlook" or "Scientific View." Impressive words! 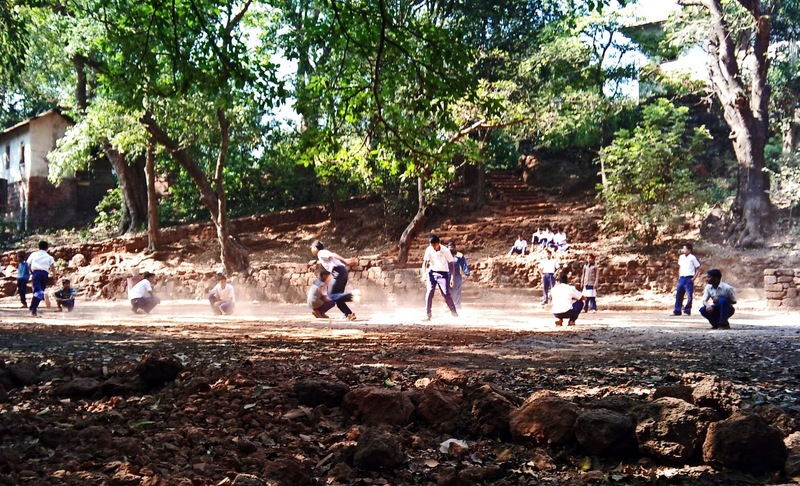 The image below is of a school playground in Matheran, a hill station near Mumbai. 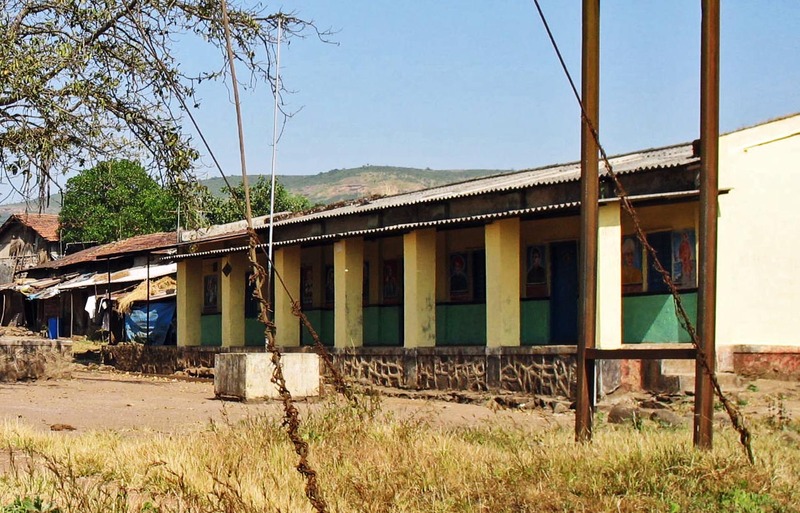 Matheran cannot be categorized as a village or a town, but it falls in the rural part of India. The boys in the photograph are playing a game called Kho-kho, a popular game in India. This picture was shot by a cell-phone camera. 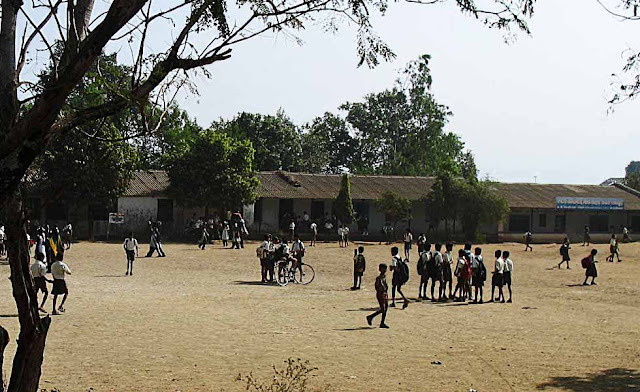 The next three pictures are of rural school playgrounds in Maharashtra, India. They were taken from quite a distance, and therefore the figures are tiny and the pictures cannot be used in an enlarged format. 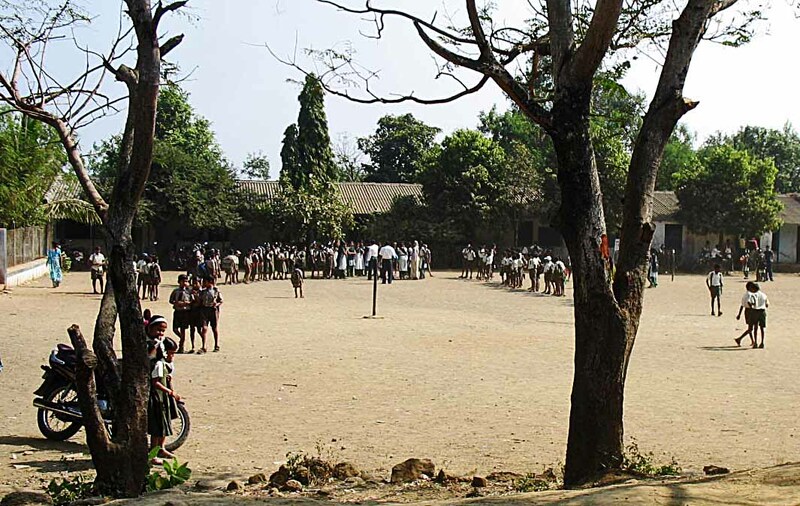 In the images you can see children playing during recess, and also standing around on the playground. It looks like a fairly large school. 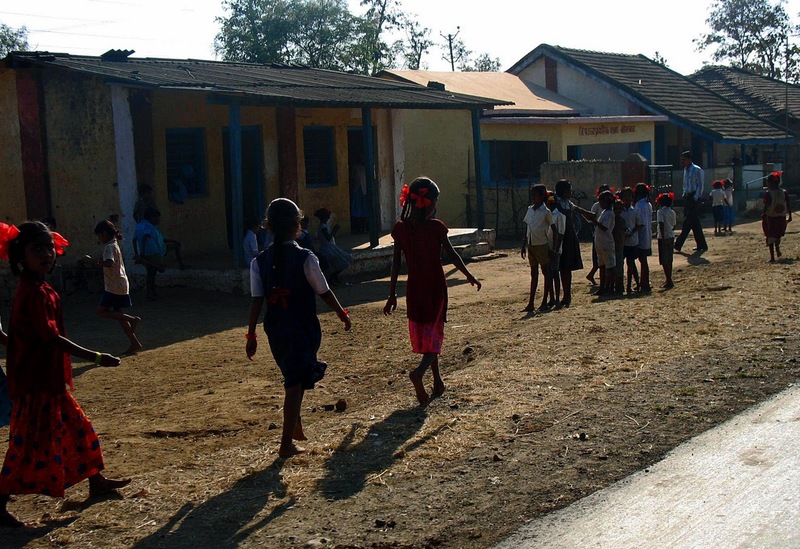 For more images of rural school children: Children playing Holi in semi-rural India or click any of the labels below if you want more pictures of Rural India and Rural Maharashtra.